Board Of Directors - The Eye-Bank for Sight Restoration, Inc.
Elected to the Board in 2002, Mr. Fabian is a partner at Nixon Peabody LLP in New York City where he is Health Services Practice Group Leader. He joined Nixon Peabody in 1994 after ten years at New York Hospital where he served as Vice President and Deputy Counsel. His broad-based experience includes the handling of legal matters in substantive areas as commercial transactions, managed care, fraud and abuse, medical malpractice, liability insurance, risk management patient’s rights and governmental regulatory agencies among others. Mr. Fabian is a graduate of Oberlin College and St. John’s University School of Law. Elected to the Board in 2014, Mr. Corbett is Managing Partner at Zephyr Internet Partners. He is an experienced operating manager in situations of uncertainty and change in both Entertainment and Financial Services. He has been the COO of EMI Music Publishing and EMI Recorded Music. In addition to Mr. Corbett’s extensive experience in finance (Prudential, Lehman Brothers and Salomon Brothers), he has also served in U.S. government at CBO, as Chief of Staff (HEW) and as Associate Commissioner of SSA. Additionally, he has experience in local, congressional, gubernatorial and presidential campaign management. He is a member of the Alumni Board of Harvard Business School and a marathon runner (New York and Boston). Corbett received his B.A. from Harvard University and his MBA from Harvard Business School. Elected to the board in January 2008, Ms. Ahmad is Principal and Co-founder of Goldenridge Capital, LLC, a New York City private investment firm, where she sources and evaluates acquisition investment opportunities. Prior to founding Goldenridge Capital, LLC, Ms. Ahmad was a Vice President in the Private Equity Group of Goldman Sachs and Company. Previously, she was an associate in the investment banking division of Morgan Stanley. She received her M.S. from The Wharton School, University of Pennsylvania. She also holds a M.S. in Public Health from the University of Michigan and a B.S. in Biogenetics from the Massachusetts Institute of Technology. Elected to the Board in September 1999, Ms. Heisler is the Executive Director of American Friends of Soroka Medical Center. She was previously President and founder of the Tudor Healthcare Group, Inc., specializing in global nurse recruitment, and a Vice President at Citigroup, with 15 years experience in retail industry corporate finance and trade finance. She has family experience with eye donation: Her son became a living eye donor following a traumatic accident. Ms. Heisler graduated from Barnard College, Columbia University and received her MBA from the William E. Simon School of Management at the University of Rochester. Elected to the Board in September 1998, Ms. Banks is currently a fundraising professional with Guiding Eyes for the Blind. She donated her husband’s corneas after he died awaiting a heart transplant in 1992. She is Co-Chair of Transplant Support Organization (TSO), a nonprofit for transplant candidates, recipients, and their families and friends. Ms. Banks has been active in increasing donor awareness, speaking to various organizations across the nation, including The Eye Bank Association of America, UNOS and the American Society of Minority Health and Transplant Professionals. She served on the boards of UNOS and the Coalition on Donation (now Donate Life America). In the past, she was a member of the National Donor Family Council and the public education committee of the National Kidney Foundation. Ms. Banks was an Issue Editor at Reader’s Digest and Associate Director of Marketing and Communications at StoryCorps. She received her B.S. from Goucher College. Elected to the Board in 1997, Mr. D’Ambrosio served as President of the Board of Directors from 2009 to 2015. He is the founder and President of Ibis Management, LLC, an investment management firm. From 1988 to 1996, he was a Managing Director of The Taylor Simpson Group and previously a Vice President at Hampton Partners. Prior to that, he was a member of the Corporate Finance Department of Drexel Burnham Lambert Inc. He received his B.S. degree from the Massachusetts Institute of Technology. He is also a CFA charter holder. Elected to the Board in June 2004, Mr. DiCenso is currently a Tax Manager in the Merger and Acquisition Services Group at Deloitte and Touche LLP, New York. Since 1998, he has held several positions at this firm, including Senior Consultant with the International Tax Group in Philadelphia and Tax Manager with the National Transfer Pricing Team in Washington, D.C. Mr. DiCenso earned his B.A. in Philosophy from the University of Notre Dame, his J.D. from the Claude W. Pettit College of Law, Ohio Northern University and his LL.M. in International and Comparative Laws from Georgetown University Law Center. Mr. DiCenso has also co-authored several research articles related to international tax and is fluent in Italian. Elected in 2010, Mr. Kayaian is President of Mosaic Enterprises, LLC and a 25-year veteran of the business of global corporate sponsorship and marketing for a wide range of properties and events. Past clients include: Madison Square Garden, the NBA, NFL, XFL and NASCAR. Mr. Kayaian is one of the founders of the NBA’s International division, and was a Managing Director of the NFL’s European operations. Born and raised in New York City, Mr. Kayaian holds a B.A. in Marketing from St. John’s University and resides in Westchester County with his family. Elected to the Board in 2017, Ms. Larson is currently Managing Director of Manager Research at Sandalwood Securities Inc. Prior to joining Sandalwood Securities Inc., Ms. Larson was Vice President of the Private Portfolio Group at Citigroup/Solomon Smith Barney Inc. Previously, she served as Corporate Director and Trustee of Nationwide Circuit Products Inc. and held account executive positions with a variety of investment firms. Ms. Larson received her MA in International Management from the American Graduate School of International Management and holds a BA from Rutgers University. Elected to the Board in June, 2018, Jeanne McCooey is recently retired as Senior Managing Director of Communications for the Metropolitan Golf Association (MGA) where her career spanned for nearly 40 years. While there she was the founding staff member and contributing writer for The Met Golfer magazine, now in its 35th year in publication. She also was a founding member of the MGA Foundation, the charitable (501c3) arm of the Association and served as its Director of Operations for 20 years. She is credited with creating GOLFWORKS, the Foundation’s flagship program that provides paid internships for at-risk youth at the association’s area country clubs. Ms. McCooey is the 2015 recipient of the MGA’s highest honor, the Distinguished Service Award. She is a graduate of Hunter College in New York with a B.A. in English. Elected to the Board in 1996, Mr. Mittenthal is President of TCC Group, a management consulting firm that provides planning, evaluation, and grants management services. He joined the firm, formerly known as The Conservation Company, in 1989. He is a member of the International Network on Strategic Philanthropy, an initiative involving 58 individuals from North America, Latin America, Europe and Asia. Mr. Mittenthal spent 12 years at the New York Community Trust, where from 1983 to 1989 he served as a Vice President for Program, overseeing the discretionary grant program at the largest U.S. community foundation. Active in civic and cultural affairs, he served for six years as a mayoral appointee to the New York City Commission on Cultural Affairs. He currently serves on the boards of Symphony Space and the Alliance for the Arts and served as a Trustee of Meet the Composer, The American Symphony Orchestra League and the Orchestra of St. Luke’s. He is a graduate of Roosevelt University and received an MBA from Northwestern University’s Kellogg Graduate School of Management. Mr. Mittenthal is a bilateral cornea recipient. Elected to the Board in 1996, Ms. Nordquist has been active in local community affairs on Long Island including The Wantagh Auxiliary of Cerebral Palsy, Boy Scouts and her parish. She retired from the position of Director of Student Enrichment at St. Martin de Porres Marianist School in 2014. The Nordquists donated their son’s eyes to The Eye-Bank when he died in a tragic accident at the age of two and The Young Ambassador Scholarship in Memory of Christopher Nordquist was established in his memory. 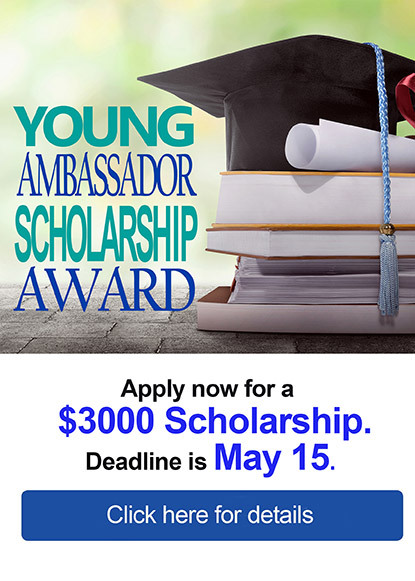 This scholarship is awarded each year to a high school senior who has helped to promote eye donation through a community service project or by helping to educate others about the need for eye donation. Elected to the Board in June, 2018, Daryl Paxson is currently an appellate counsel at Heidell, Pittoni, Murphy & Bach LLP, a law firm specializing in medical malpractice, professional malpractice, and products liability defense. Previously, Ms. Paxson served as a litigation associate at the law firm of Kirkpatrick and Lockhart as well as Lord Day & Lord, Barrett Smith. She received her J.D. from Fordham University School of Law and her B.A. in Political Science from Pennsylvania State University. Elected to the Board in June, 2018, Dennis R. Tarzian is a Managing Partner and Member of the Board of Directors at BCHT Holdings LLC, a privately held investment group. Prior to joining BCHT Holdings LLC, Mr. Tarzian was Co-founder, Chief Operating Officer, and Managing Partner at National Registered Agents Inc., a legal services and technology firm. Previously, he was President and Chief Executive Officer for New Century Education, a privately held provider of instructional technology and computer-based training products. Mr. Tarzian received his MBA from Columbia University’s Graduate School of Business and his B.S. in Systems Engineering and Computer Science from the Polytechnic Institute of New York University. He is a Member of the Board of Directors for the Karagheusian Foundation and is both a Member and Treasurer for the Fund for Armenian Relief. Elected to the Board in June, 2018, Elizabeth Wruszek is Senior Vice President of the Enterprise Project Management Office at the Newport Group Inc., a consulting, asset management, and administration firm that specializes in the designing, financing, and administration of qualified and non-qualified executive benefit plans. Prior to joining the Newport Group Inc., Ms. Wruszek was the Vice President of the Enterprise Portfolio Management Office of Healthfirst in New York. Previously, Ms. Wruszek was Vice President of Planning and Project Management at Clayton Associates LLC, a venture capital firm specializing in investments in healthcare and healthcare technology companies. Ms. Wruszek received her A.L.M. in Finance from Harvard University Extension School, her MBA from Aspen University, and her B.Eng. from University of York in England. She is a past member of the Board of Health Republic Insurance. Elected to the Board in January 2008, Mr. Zambrelli is President and Creative Director of Zambrelli, LLC, a New York based advertising agency which he founded in 1997. With an emphasis on creativity and strategic development, Zambrelli, LLC serves such clients as Chuck E. Cheese, Firmenich, New York Laundry and Sideways and the Partnership for a Drug-Free America. Prior to forming his agency, Mr. Zambrelli worked with Ogilvy and Mather; Young and Rubicam; and Wells, Rich and Greene, with clients such as Proctor and Gamble, Sports Illustrated and General Foods. Mr. Zambrelli received his B.A. from Harvard College and a GSAS from Harvard University. Elected to the Board in December 1981, Mr. Immergut is the former Chairman of Milbank, Tweed, Hadley and McCloy LLP (1995 – 2013) and has been a partner in the firm since 1980. Mr. Immergut has extensive experience in a wide variety of corporate transactional work, including merger and acquisition transactions, financing transactions, leveraged leasing and real estate finance. He is responsible for, among other clients, the firm’s representation of JP Morgan Partners, Teachers Insurance and Annuity Association of America, Anheuser-Busch, Astoria Financial, Mastercard, NASCAR, Tyson Foods, Tyco and William E. Simon and Sons. Mr. Immergut received his B.A. from the University of Pennsylvania and his J.D. and MBA from Columbia University. He serves as a Trustee and Past-President of the American College of Investment. Mr. Immergut is a member of the New York State Bar Association and the Association of the Bar of the City of New York. He serves on the Board of the Legal Aid Society and on the Columbia Law School Board of Visitors. He is a member of the Council on Foreign Relations. Elected to the Board in June 1995, Dr. Paton has been an Honorary Director since his retirement from active medical practice as an ophthalmologist and cornea transplant surgeon in 1994. His career was in academic medicine, serving on the faculties of Johns Hopkins (The Wilmer Institute); Baylor College of Medicine (Director, the Cullen Eye Institute); Professor, Cornell University College of Medicine (Chairman, Ophthalmology at Catholic Medical Center of Brooklyn and Queens). Over the years, he has served eye-banking in various countries of the Mid-East, South America and Asia. He is a past Chairman of the American Board of Ophthalmology and founded Project ORBIS, serving as its Medical Director from 1972 to 1987. He is the recipient of two honorary degrees (one from Princeton University, his alma mater), and in April 2005 he received the Distinguished Alumnus Award at Johns Hopkins. In 1984, he received the Paton Award, named for his father, R. Townley Paton, M.D., from the Eye Bank Association of America. In addition, Dr. Paton was awarded the French Legion of Honor from President Mitterand and the President’s Citizen’s Medal from President Reagan, the first physician so honored.